Imagine yourself in a dark room, so dark that you can’t even see your own hands. You don’t know the spaces’ boundaries, the only thing you know is where the floor and the ceiling are, based on the actual gravity and your own body weight in that space. Now that you are used to this apparent darkness, a little light dot, no wider than a one cents coin, starts to appear at what seems to be a far distance. The room becomes clearer and clearer, the space you are standing in, is defining itself piece by piece, as the space is filling with light. You’re thinking that the light is getting stronger, when in fact it is not. Your eyes are desperately seeking the light in that room, they are so desperate that they catch every light particle for you to see. With almost nothing, you can see as if it was in bright daylight. This painting is tending to do that by decomposing the light. 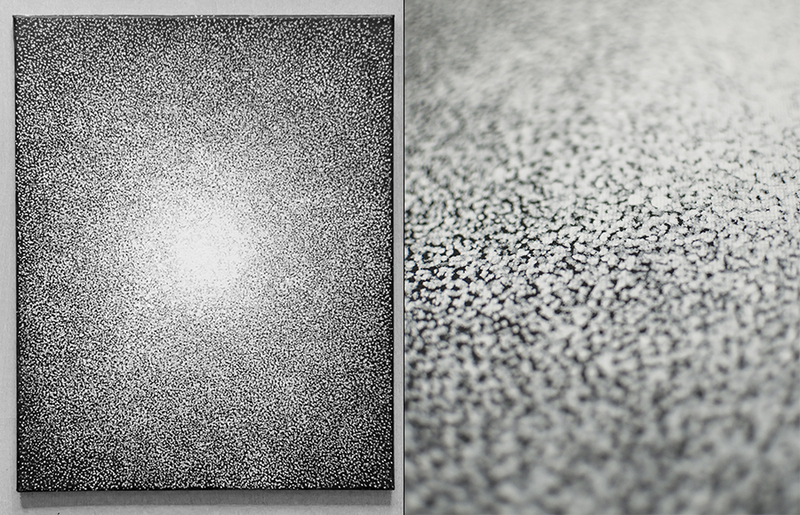 From the distance you see a white dot spreading itself on the canvas, as if it was a light losing intensity while reaching the limits of the frame. Your eyes can identify each single particle, as if you could clearly see how the light is composed.